Putera Sampoerna has always been full of surprises. In the 1990s he propelled HM Sampoerna to be one of the nation’s top businesses by bringing in professional management and introducing the low tar, low nicotine category of cigarettes in the Indonesian market. Even from the early days, he was extremely patriotic and held the belief that education is the key to progress in Indonesia. He had an almost fanatic zeal about education and its role in national development. He set up the Sampoerna Foundation and channeled some of the profits from the tobacco business into it. It was a substantial sum of money and the Sampoerna Foundation quickly became known as the home of prestigious scholarships. In 2005, Putera stunned everyone by selling off the business empire he inherited from his grandfather and father, HM Sampoerna, to Philip Morris Indonesia. Just like that he walked away from a multi million dollar industry that took his family three generations to build. But while he sold off the business he took with him Sampoerna Foundation. In 2009 he renamed it the Putera Sampoerna Foundartion. The foundation has since expanded its activities into women’s empowerment, entrepreneurship and disaster relief to complement its education-related activities. Putera is now surprising corporate watchers again by deciding to start – wait for it – a blog. 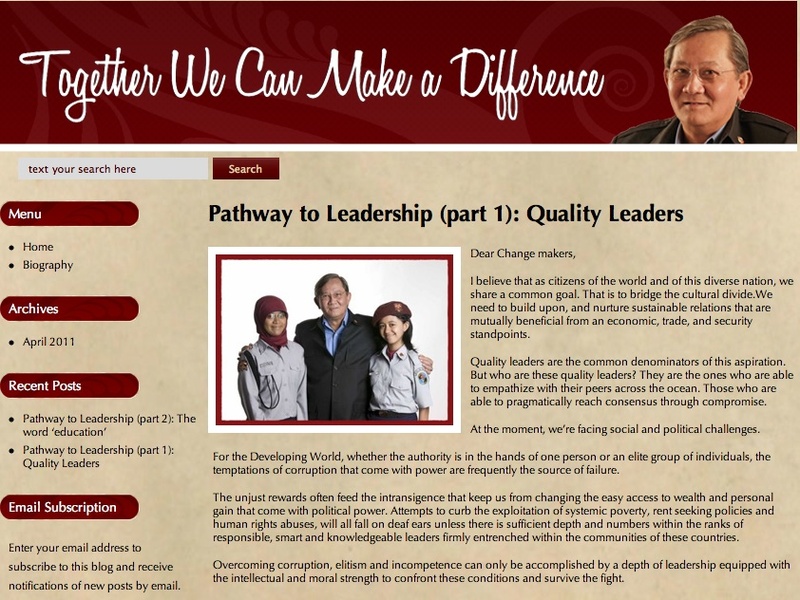 The blog, which was launched on April 1 to little fanfare, has the title Together we can make a difference and his first posting is about The Pathway to Leadership in two parts. It is still not known how much Putera, who has a reputation for not tolerating fools, will engage the readership of his blog. If he does,however, it would be interesting because it would shed some light into how the man, regarded by many as a business genius, by others as a mystery and still others as somewhat eccentric, thinks.